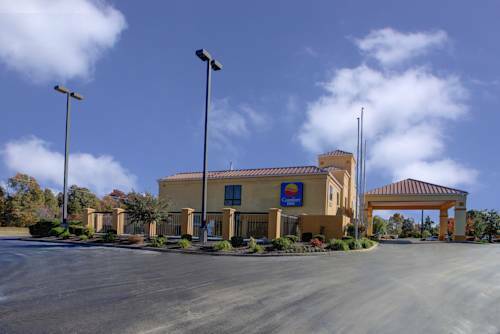 The Comfort Inn hotel in Brownsville, TN will get you rested and ready to take on the day for leisure or business. Our smoke-free hotel is near the Hatchie River, downtown Brownsville, Elma Ross Public Library and College Hill Historic District. Enjoy amenities that include free hot breakfast, free WiFi, free coffee, a fitness center, outdoor pool, safe, guest laundry facility and business center with copy and fax services. Each spacious guest room features a HDTV, coffee maker, hair dryer, iron and ironing board. Select rooms offer a refrigerator, microwave and sofa sleeper. Connecting rooms can be requested. Also, earn rewards including free nights and gift cards with our Choice Privileges Rewards program.